BabylonJS is a powerful library for 2D and 3D WebGL development. While it is mostly geared towards 3D Games, it also includes 2D Sprites and Particles. Like all physics engines, the first step for using LiquidFun is to create a World. To create water and soft body physics using LiquidFun, we use Particle Groups. In the example below, we are creating a "rectangle" that will be filled with liquid particles. You cannot create an app bundle containing more than one package per architecture. Value of AppxBundlePlatforms property is 'neutral|neutral'. You cannot create an app bundle which contains a neutral architecture package along with packages for other architectures. Value of AppxBundlePlatforms property is 'neutral|neutral'. If I did a Build/Clean Solution and then a Rebuild, the project was happy again, UNTIL I made another change. ... and all was happy again. On a related note, the change from "neutral" to "x86|x64|arm" is because UWP apps are compiled to Native code when you choose a Release build. This promises 60% faster startup and 15-20% less memory use! 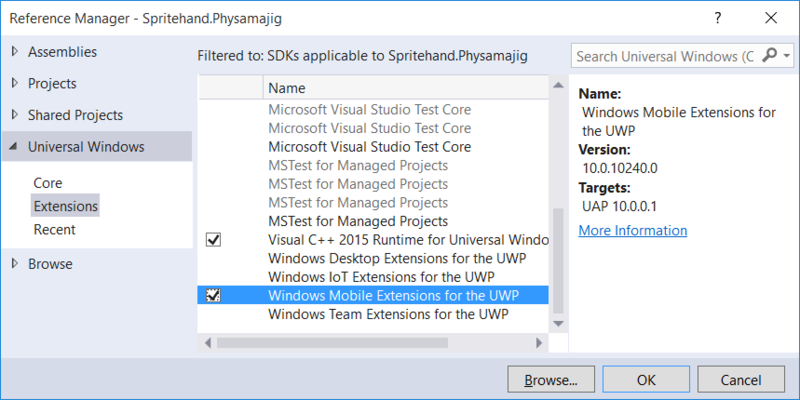 Windows 10 (UWP) apps can be deployed to any device type as a single binary. But sometimes the capabilities of each device can differ. For example, a phone running Windows 10 has a Status Bar that shows network, battery and other info. But this Status Bar is missing on other devices such as the Desktop. The type name 'StatusBar' could not be found in the namespace 'Windows.UI.ViewManagement'. That will make the compile happy, but what if we run this code on a Desktop or other device that doesn't have a Status Bar? Additional information: Requested Windows Runtime type 'Windows.UI.ViewManagement.StatusBar' is not registered. So the key is the IsTypePresent method, which accepts the type name to test for. Given this, we can stick with our single binary, avoid more ugly compiler directives, and support each specific device's capabilities! 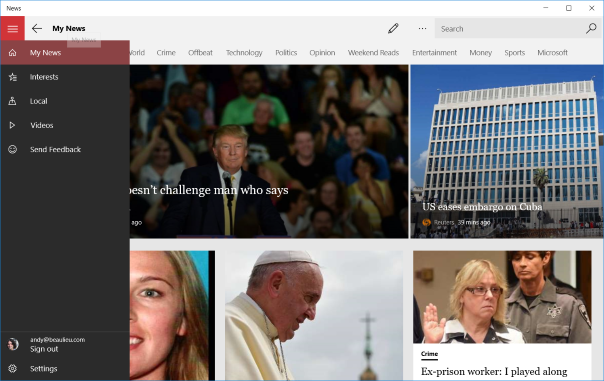 I recently started moving one of my Windows 8 XAML apps to Universal Windows Platform (UWP) and was looking for some guidance on design and interaction. 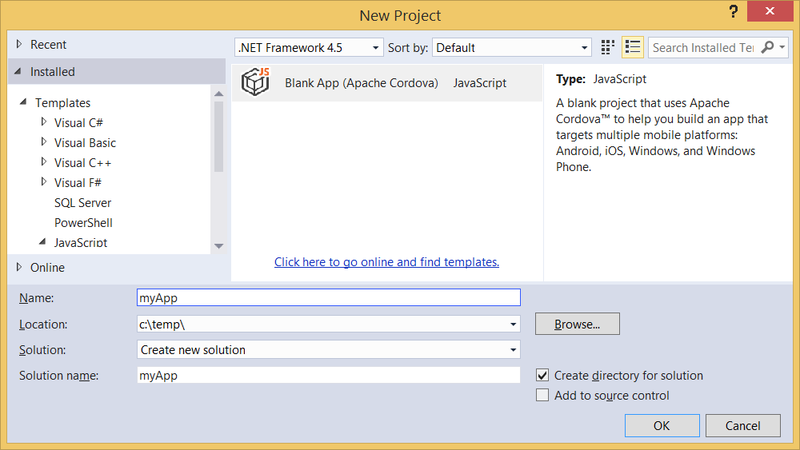 In previous versions, Visual Studio contained templates for Windows Apps including a Grid and Hub layout for Metro. But for the new Windows 10/UWP design, there are no templates included in Visual Studio 2015 at this time. As you can see, the metro-like concepts such as horizontal scrolling, slide-out menu options and mandatory full screen have been abandoned for vertical scrolling and *ahem* hamburger menu navigation. So, as an App Developer, where do you go to get a "quick start" or guideline for UWP? Here are a few resources that I found useful. UI basics for UWP apps breaks down the parts of an app from a high level, but stops short of code examples. Still a good idea to read through this though! 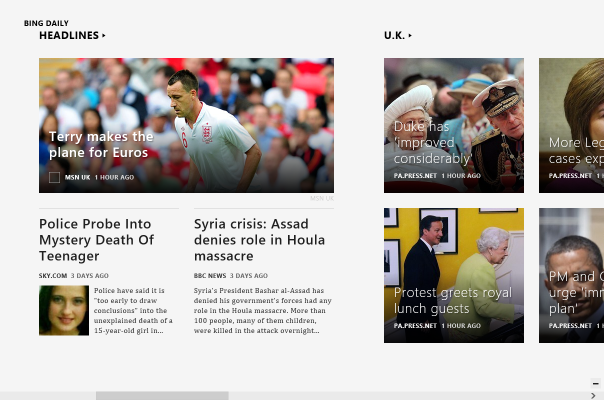 Navigation menu (XAML) sample is a concrete example of the Hamburger Menu integrating with navigation. I used this as a starting point for porting my app. Template 10, while I chose not to use it, offers a more fleshed out starting point for a XAML-based UWP app. I started poking around with this, but it appears to be still a Work-in-progress at this point and had a bit more than I needed for my app conversion. What is the downside you ask? The main downside is the size of your deployed app. You can expect the Crosswalk library to add about 15 MB to your APK if you target _either_ ARM or x86. If you choose to target _both_ with a single APK, you can expect about 30 MB added to the size. This is an unfortunate amount of bloat, but for some apps it might be just fine. But there are other downsides as well... Don't expect Debugging Support when using Visual Studio Tools for Apache Cordova (at least not in CTP3). You can however use Chrome DevTools to debug Crosswalk apps. Also in my experience, Emulator support is hosed as well - you will need a physical device to test and run your apps. 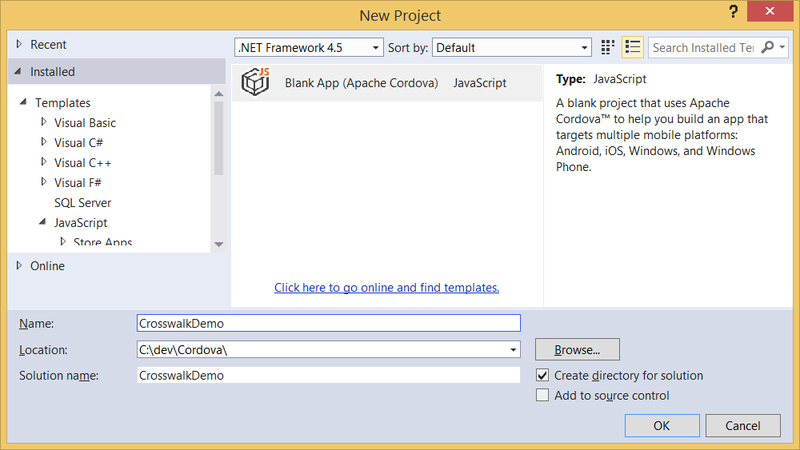 Download and Expand the Crosswalk Cordova Android (ARM) and Cordova Android (x86) packages. IMPORTANT: Make sure you get the Cordova versions!! Note that these instructions are for Visual Studio 2015 RC. In later versions, these steps might change. Go to the \platforms\android\CordovaLib subfolder of the project, and delete the contents of \platforms\android\CordovaLib. Edit AndroidManifest.xml in \res\native\android\ so that it includes the following permissions just _before_ the <application> node. Add a directory named CordovaLib in your \res\native\android\ folder. Execute a Build in VS (Ctrl+Shift+B), so that the files in \res\native\android\ are copied to \platforms\android\. NOTE: At this point, the build will succeed but Crosswalk is NOT yet enabled! android update project --subprojects --path . 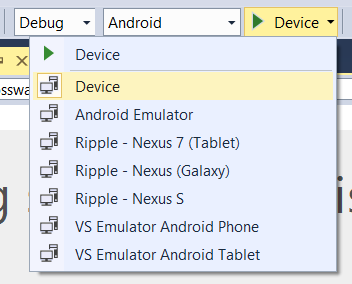 --target "android-21"
Back in Visual Studio, select Build/Rebuild Solution. This time your build will take a bit longer because it's packaging up the Chromium runtime with the APK. Run the project on the device using F5. Note that Visual Studio currently does not support debugging with Crosswalk, because it cannot attach it's debugger. 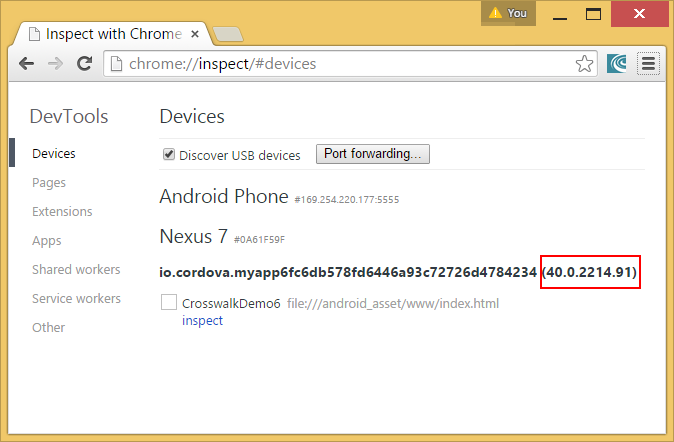 You can use ChromeDev tools to debug, however.